As a solopreneur, marketing yourself and your services is vital to finding customers but you need to make your limited funds stretch as far as possible, and get the most bang for every buck you’ve allocated to several aspects of your business. With so many things to tick off, how do you know where to invest your funds into? You may have a website built now–but what’s next? With the abundance of online marketing strategies, how do you know where to allocate those limited funds? Our guest for this episode has several years of experience in content marketing, having started as a blogger years ago, writing and creating content and tutorials for a crafts and lifestyle blog. From being a stay-at-home mom who blogs, Vivienne Wagner has leveraged her outstanding skills as a professional blogger and established a creative social media agency, Houndstooth Media Group. 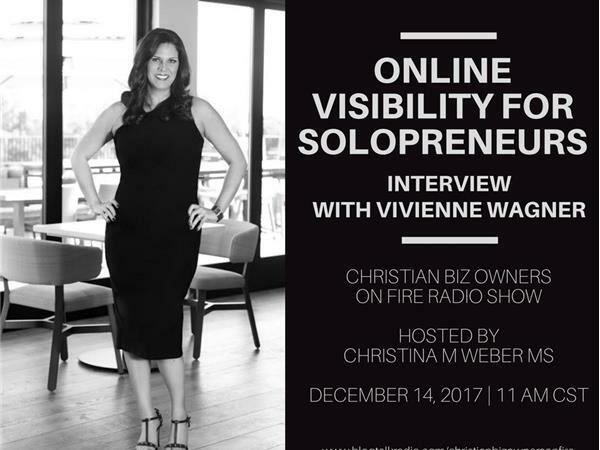 Vivienne’s company specializes in organic search and helps business owners develop their brand and be more visible online. In this episode, Vivienne share with us some strategies to help your business maximize its online presence.